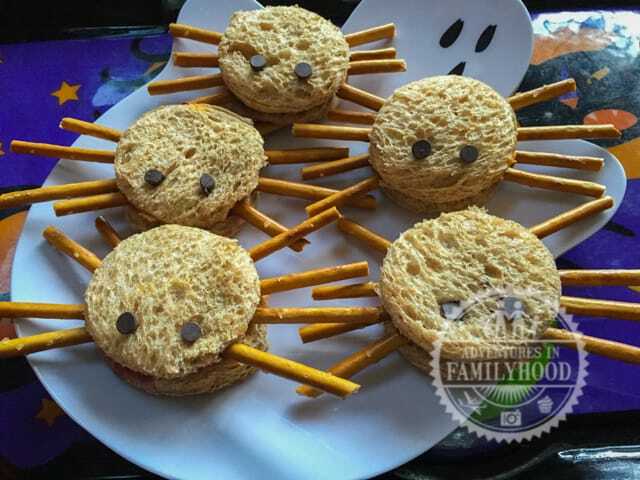 Create fun and festive Halloween snacks for kids. These ideas are super cute and budget friendly too! Halloween time is akin to Christmas in our house. From our elaborate outdoor displays to festive treats, Halloween is a pretty big deal. 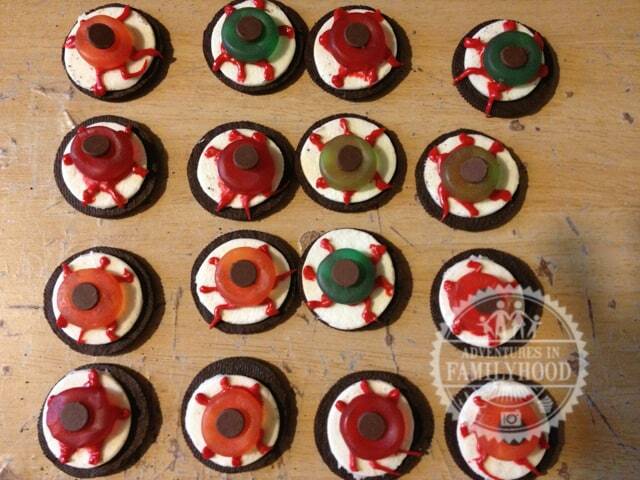 My favorite part of the celebration is making fun and festive Halloween snacks for my kids. We love snacking throughout the day and like to have a little something before trick or treating. But with everything else going on on Halloween, I don’t have a lot of time to make complicated recipes. 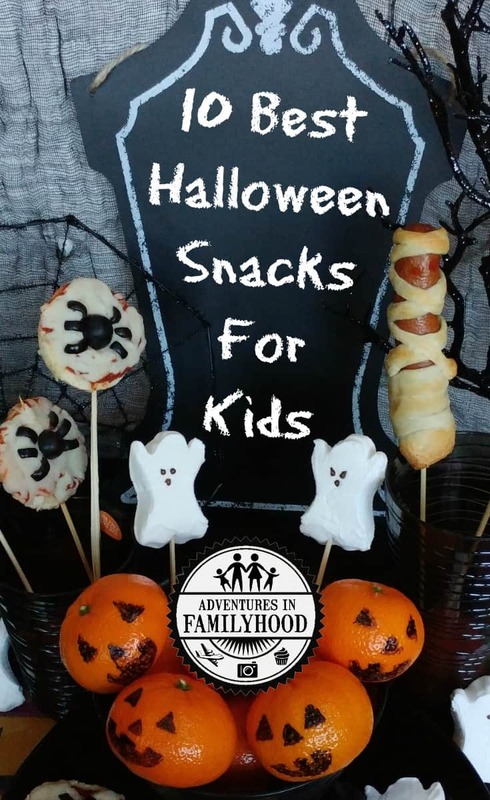 Thankfully, I’ve found some easy go-to Halloween snacks that are not only inexpensive to make, but your kids can help make them as well. The best part of these snacks is that they can be made with store bought items. No measuring, no fussing, just creating. 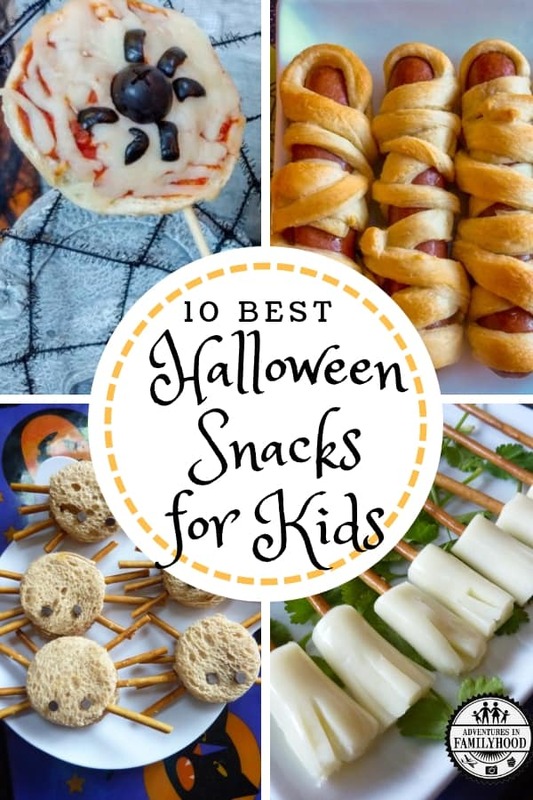 Combine a few of these ideas together to create a pre trick-or-treating meal for your little ghosts and goblins. This post contains affiliate links. 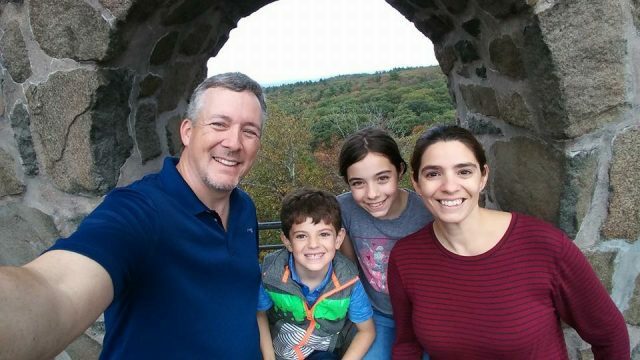 Thanks for supporting Adventures in Familyhood. Cut a cheese stick into thirds. Using kitchen scissors, create fringe on the bottom part of one of the thirds. 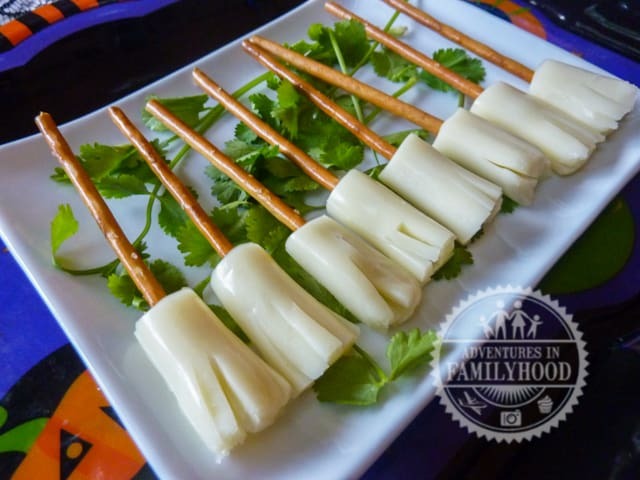 Place a pretzel stick inside the unfringed part of the cheese stick and voila you have a witch’s broom! 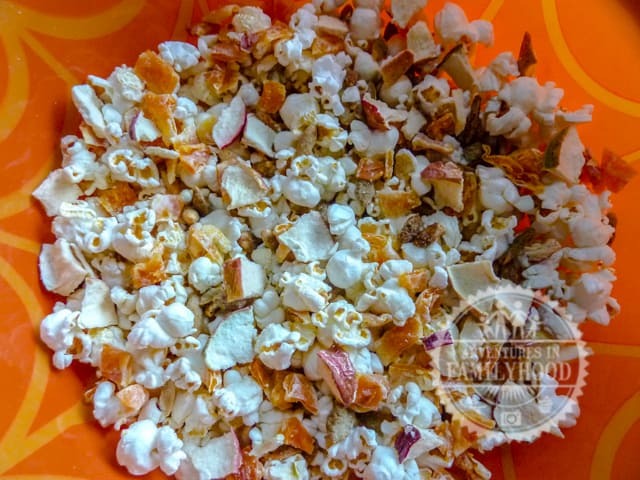 Combine air popped popcorn, dried apple slices, dried apricot pieces, and pumpkin seeds to make this colorful and healthy fall mix. Use a biscuit cutter to cut out circle shapes. Make a peanut butter and jelly sandwich using two shapes. Snap 2 pretzel sticks in thirds to create the spider’s legs. Finally, use two mini chocolate chips for eyes. Separate an Oreo cookie. Use red cake jelly to make almost an asterisk shape on the frosting part of the cookie. Place a gummy life saver on top. Insert a chocolate chip into the center. This is a family favorite. Start by cutting crescent roll dough into strips (sometimes they sell the crescent roll sheets). 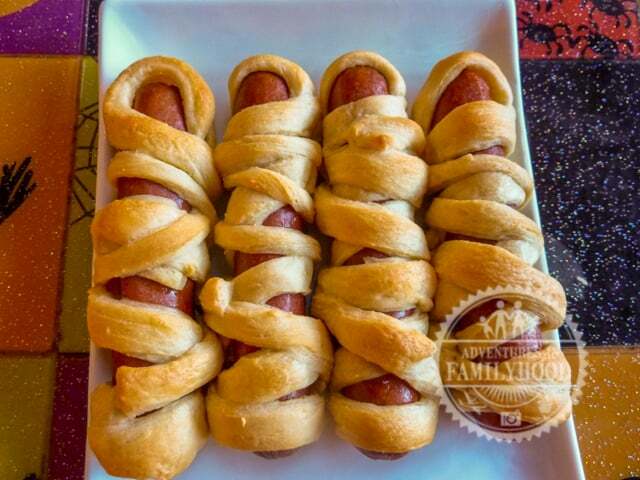 Wrap the dough around the hot dog to make a mummy. It usually takes me 2-3 strips. Bake at 375° for about 8-10 minutes or until dough is brown. All you need for this one is a bag of baby carrots, celery and green peppers. 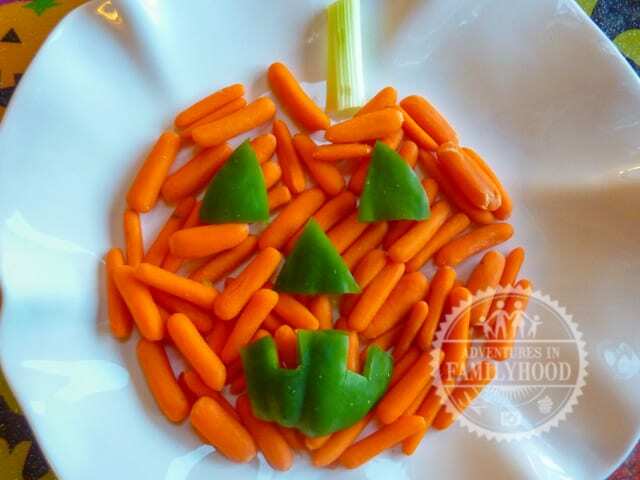 Arrange the veggies into a pumpkin shape and serve with a side of ranch dressing. 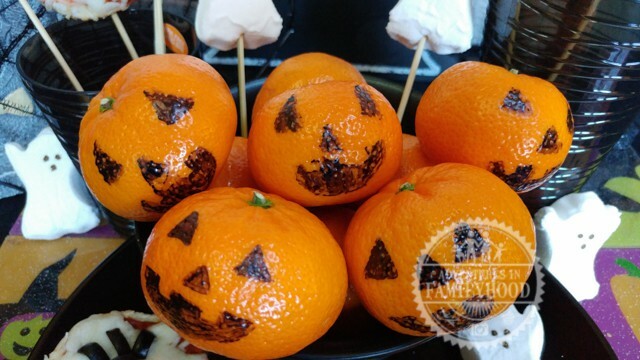 Draw jack-o-lantern faces onto clementine oranges. Since you won’t eat the peel, there’s no risk of the kids ingesting the marker. 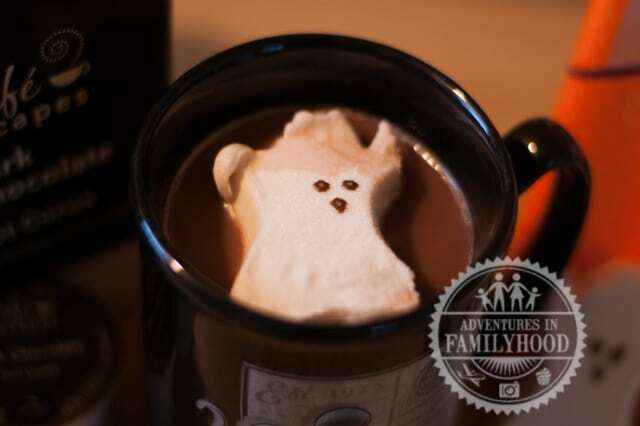 Drop marshmallow ghost Peeps into a steaming cup of hot chocolate. Super easy and perfect for those chilly Halloween nights. 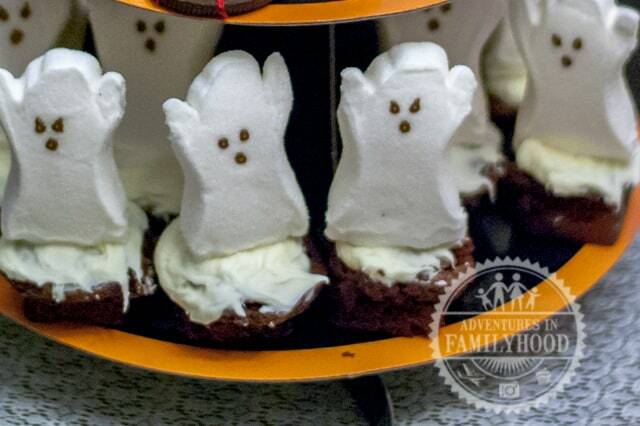 There’s no baking required to bring these ghost brownies to life. Cover store bought brownie bites with vanilla frosting. Top with a marshmallow ghost Peep. Top mini bagels with sauce and mozzarella cheese. 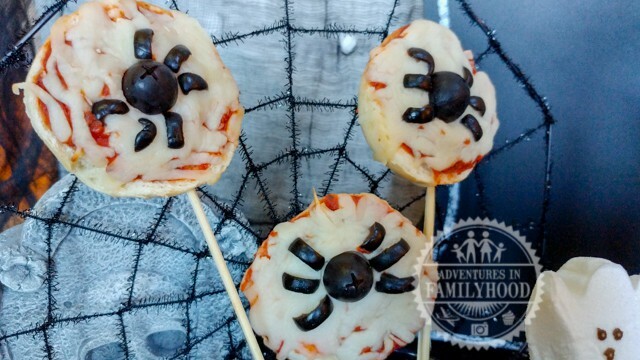 To make the spider, cut black olives to make the body and legs. If you really want to go the faker baker way, top frozen bagel bites with the olive spider. 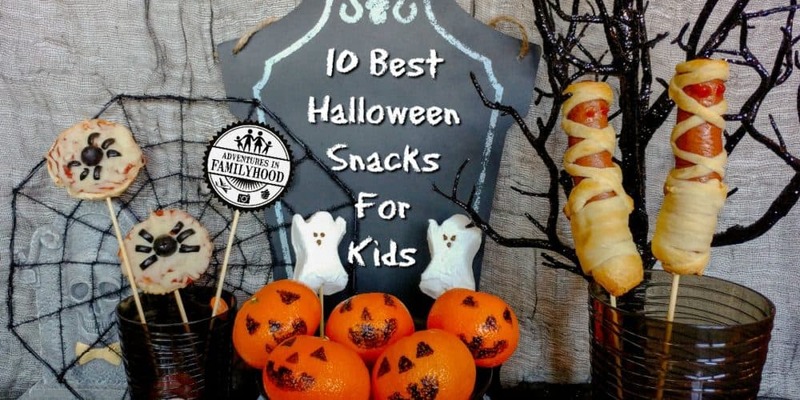 So there’s 10 Halloween snacks that you can make that will make your kids scream…for more! For more ideas and inspiration for your Halloween check out our Fall, Halloween and Thanksgiving board on Pinterest.